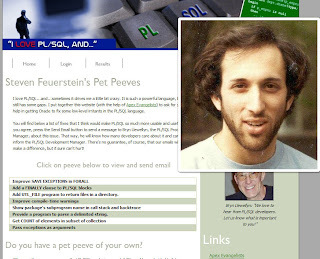 I got some messages about the title of my previous blog post and the picture you get when clicking on Steven Feuerstein's photo on the iloveplsqland.net site. To avoid problems or comments in the future I changed the title to a normal one you could expect. The website got in the meanwhile some small updates. Nothing spectacular, just some improvements Bryn asked. For ex. : "Can we get an estimate of the amount of PL/SQL they have (both no. of compilation units and no. of source code lines)." And finally about the picture... that's Steven (when he was a bit younger)! 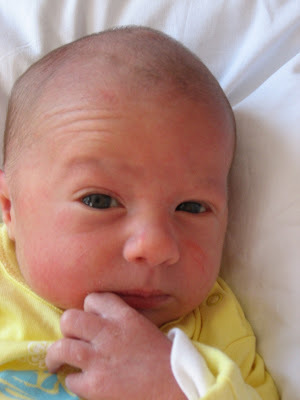 I'm Matthias Gielis, 4 days old. I'm still with my mummy in the hospital, but I borrowed my daddies laptop to write my first blog post. They say I'm tall for my weight; 50 cm for 2850 g. All midwifes are in love with me ;-) they pamper me a lot, which I enjoy so much. My daddy is calling me "little prince" and to be honest I also feel like that. I enjoy being in this world as long as my mummy and daddy are with me. He also told me; before I was here, he divided his time between my mummy and something called APEX, which I've no clue yet what it is. Now that I'm here he said, he's going to spent also a lot of time with me. I've the feeling my daddy is really in love with me and can't leave me alone. I'm also very happy with my daddy, when I'm in his arms I'm so at ease and feel secure. On my website you'll find some pictures, a little story (in Dutch) and my birth card, which my mummy made for me. Thanks mummy! 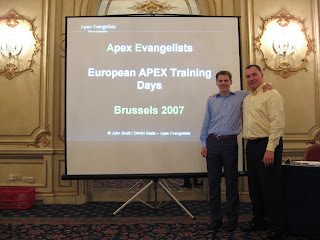 Following the success of our recent European Application Express training days in Brussels, we have set the date and location for our next APEX Evangelists European Training Days Event. The event will be a 3-day advanced Application Express course (agenda coming soon) and like our previous event will rely heavily on lots of live demos and real world examples and scenarios. We will need to limit numbers, since once the audience size grows beyond a certain point it becomes more time-consuming to respond to questions and we cannot be as ‘interactive’ as we like to be (which from the feedback from the previous even was one of the things that people felt set us apart from other training events they’d attended). So, if you’re looking for some advanced Application express training, from people who *really* use it day-in day-out and can help to answer those real-world questions you have, then sign up! Note that, whilst we are only doing a few of these ‘open’ trainings a year, we are of course able to perform on-site training specifically for your company. So feel free to contact us via the APEX Evangelists site. You can register directly for the London 2008 training by using this link. 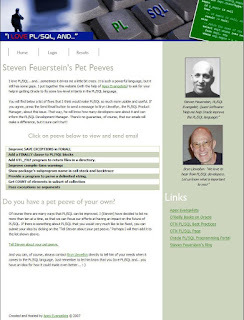 John Scott and I are very pleased to announce a website we created for our friend, Steven Feuerstein. 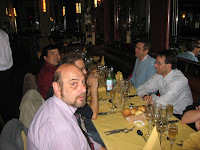 A while ago I blogged about "Apex Evangelist meets PLSQL Evangelists" (see also this pic). I met Steven for the first time in real life at ODTUG last year. 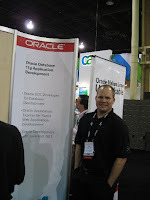 I've always been admiring him... the way he presents, his charisma, friendliness and of course his PLSQL knowledge. So, doing this project was a real honour! It's a fairly simple site, but if you look good, you'll see the integration of some 3rd party products like "Highslide" (click on the picture of Steven!) and "Captcha" (register for an account). You'll also see some AJAX (Asynchronous Update) in the Flash Charts. We hope you'll like the site and hope it can be a step towards the improvement of the PLSQL language. John and I really enjoyed making this site... Shall we also make such a site for APEX? As we went out on Wednesday we started the last day a bit later then planned (as some people requested that). Probably we'll change our agenda in the future, but then keep to the predefined schedule. 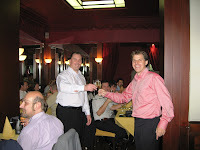 I had the honor to start on the last day ;-) (see previous post about the diner and the wine, that's why this smiley). We planned three presentations and a longer Q&A at the end. In APEX 3.0 you get PDF printing out of the box (if you integrate it with FOP, Cocoon, BIP, ...). More than 25 successful demos, but then my pc abandoned me! Although the day before everything worked still fine, now my BIP Word plugin didn't popup. For my last presentation (see further) I installed some other (extra) XLIFF editors, which needed some JVM's (v1.6). Maybe the other JVM's broke my system or even more stupid, during the morning Windows updated itself with some patches (automated updates). A lesson I learned! For OOW I'll probably use some VM's (vmware images) so I'm guaranteed that something else will not break my system. Till today I still find it a pity that my last demo didn't work straightaway like before, as it spoiled half the message I wanted to give. Some people might now think the integration with BI Publisher is difficult, but it isn't. But it is true, if you really want to get the full potential of the integration of APEX and BI Publisher, you have to know both environments. BI Publisher can do a lot of advanced things, but knowing all these will take some time to learn. During the break I reinstalled BI Publisher, so I finally could show it working. Nevertheless I got afraid my system would blow up again! The last presentation of the European Apex Training Days was about Localization. We thought in Europe this topic would be hugh, but when asking the attendees how much they already did with Globalization/Localization the response was fairly low. I didn't only talk how to make your APEX application multilingual (follow the six steps in APEX), but I stretched it out to the database requirements, different XLIFF editors and that you need to think about a lot more then just the translations. After my last presentation we answered the questions of the people. The first day we installed a whiteboard in the back of the room where everybody could write down a question, from the session or even questions they had about APEX we didn't talk about. The picture shows you some of the questions we got. After going through the feedback and catching up with (urgent) mails of the last days, we closed our laptops for the night and decided to go and celebrate the successful three day training. We had some nice lobster in the famous Rue des Bouchers in Brussels. 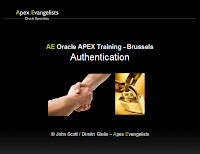 We also made a little video of the training days, which you find on our Apex Evangelists site. 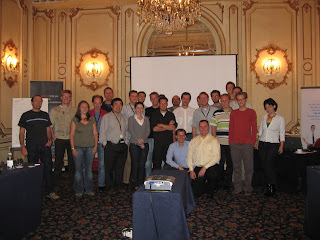 This is the end of my postings about the first European Application Express Training Days. I would like to thank all participants which made it an unbelievable experience. I hope you all enjoyed these trainings as much as I did. The second day we started a bit earlier because we had some big topics and wanted to let the people do something! I'm sure John will go into more detail about that on his blog. There were again a lot of live demo's into this presentation. Most people were really interested in this area, which is not so surprisingly. AJAX is *hot* these days and it allows you to have a real web 2.0 app. That's why we foresee for this presentation a longer time (over 2 hours). After this session we had our "special" mystery guest speaker: Carl Backstrom. If there were no problems with his flight, Carl would have been "live" in Belgium, which would have been awesome... as he couldn't make it, he recorded an exclusive video message about AJAX and APEx 4.0. Thanks Carl! You did a great job! The room was so silent during the video and I saw some peoples mouth falling open... Just to say the people really enjoyed it. For us it was also an honor that we could show some more after my "sneak preview" blog post of some weeks ago. Should you use 3rd party integration? Yes and no. You've some pros and cons. But there're some really cool things in "wonderland" or other additions that make your life much easier. The last presentation of the day was about the Apex Dictionary. John showed some advanced features you can use in APEX by using the APEX Dictionary. I think this is one of the topics most people are underestimating... A meta data-driven framework as APEX can be really powerful. It's unbelievable what you can get out of the dictionary. 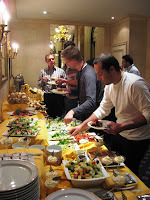 In the evening we organized a special "AE-diner". 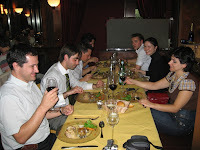 We invited everybody to join us to an exclusive restaurant, La Vierge Noire, in Brussels. I also would like to thank IBM and Oracle for their sponsorship. With their help we could do "that bit" more. I really liked that evening. Talking with people offline, with a nice wine and some excellent food. 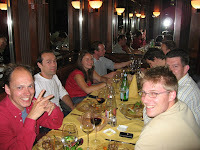 Also, for John and me it was special... we both gave a little speech and toasted on our first open APEX training days. Some people arrived already on Monday evening, where others left home very early the same day to be on time (one of them left at 4 am!). From 8 till 9 o'clock we planned registration. While people were waiting for the other attendees they could enjoy a little breakfast. It's not evident to be on time the first day in a country you don't know, so it's a good idea to have a time slot to arrive. It's also a nice time to talk to the people. Some I knew from their blog, so it was a pleasure to meet them in real life. Some of the Oracle blogging people who attended our training; "Jornica", Patrick and Michiel of AMIS and Douwe, Bart and Menno from Caesar. We printed a name tag for everybody and put a folder with the agenda on their desks. I also want to thank Kristel Geukens, my wife and owner of G&G Design, a company specialized in graphical and conceptual design, for the great support. She made the name tags and all layout and graphics. So, basically we had four sessions a day which we tried to build up logically. I spoke about how to make a "waaaw"-site, how we (AE) make a new design (there's a lot more than just APEX) and how to really create a theme and templates in APEX. Did you for ex. know that there're two main choices in creating the layout of your website/application? I call it the choice between "table" layout and div/css layout. Although the 18 themes that come out of the box with APEX are mainly build as a "table" layout (or another example; the DG Tournament site), there exists something else. An example of the div/css layout is our Apex Evangelists website. John covered this big topic. When we were discussing this topic before and John told me what he wanted to cover, I even didn't realize all that was in! Not for nothing we have another presentation only covering SSO. John concentrated on APEX users and Custom Authentication. I think a lot of people didn't realize you could do so much with the APEX (or cookie) users. Did you know about the authentication functions in APEX_UTIL? Or did you ever want to lock some accounts? John showed it live! I already blogged about it before, if it's useful and advanced enough (or not) for an Advanced APEX training? I still believe this is a good topic to get people on the same level. 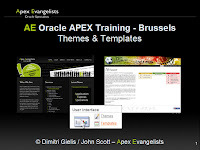 For our training we had some people just starting with APEX where others already developed for over 2 years. Do you know for example the difference in a "SQL report" and a "Wizard report"? I didn't limit the presentation to "only" APEX, but also talked about SQL Developer, Explain plan, SQL injection, bind variables etc. When doing this presentation, it's sure people start asking questions. 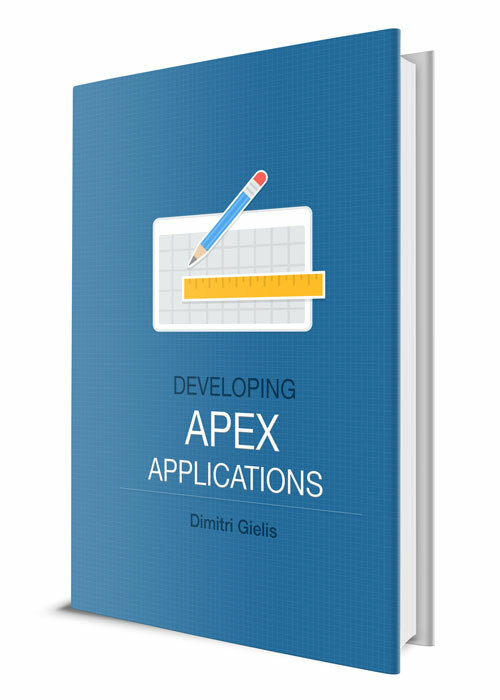 As APEX is such a rapid application development tool, in 9 out of 10 I can demo it right away. Have you ever looked at all possibilities you had with reports? You can't show it on one page! Somebody knows the difference in an "Updateable Report" and a "Tabular Form"? Or already tried the Customizations link? Nevertheless, if I know the audience is really experienced I'll probably change some things and show for ex. drill down reports. This is really Johns corner. John has so much experience due to the APEX hosting he provides and talked about his top 4 performance tips. He's not only talking about that, John also proofs what he says. I won't tell you his 4 tips, that's something you should ask him ;-) But, I'm pretty sure there are not that many persons using all that. At the end of the day we also planned some Q&A time. Although we got a lot of questions during the presentations, I think the people appreciated we had some time for them after the sessions with their day-by-day difficulties. 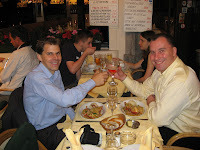 During the evenings John and I had some food, talked about the day and prepared for the next day. We were the only persons sitting in the bar with a laptop, but the waiters got used to it and were very understanding. You may also read how John (Scott) experienced our training days on his blog (day 0, day 1). A few months ago John and I decided to organize some Oracle Application Express trainings. First you've an idea and slowly it grows till the moment you announce it, but even then the preparation is not yet over. We wanted to do something special, give an "AE-experience" to our participants. 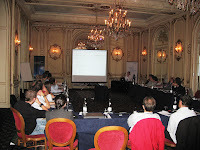 Second, we had to rent a place to do the trainings and chose for the exclusive Plaza hotel in Brussels. As we call it the "European APEX Training Days", we thought Brussels would be a good place to start, as it's the capital of Europe. Depending the number of people you need to find a room. Not to big, not to small. Although we had no idea how many would be interested to attend, we planned to have around 25 people and limit the numbers to that. The size of the (training) room depends on the format of your sessions. Are you only "teaching" or also discussing with each other? We finally chose for the most interactive form, a U-format, in the nice "Versaille" room. It's amazing to see how the sign ups went. You get some in the beginning, then it's quiet for a while, it starts again and at the end you get some more. Even the last week we got some new sign ups. The other side of the medal is also true, we also had some late sign offs, which was really difficult for us, as we had to pay a lot in advance. So, if you want to organize something, unless they paid, it's not sure they will come after all. The place to give the training is one of the things you need to prepare. Another one is where to stay, as we would have people flying in from other countries. Because we booked an hotel for the training, having the nights there was most appropriate. Nevertheless you need to pre-book some rooms. As it was an exclusive hotel, the prices weren't that cheap (although we negotiated a special price), so we also offered an alternative list of hotels. The preparation of the training material! 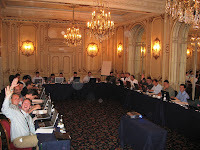 As we already talked at OOW, IOUG and ODTUG we knew it takes some time to prepare a presentation. Doing a 3-day course isn't different! 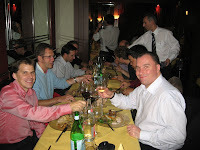 Preparing our first "European Oracle Apex Training Days" (EATD) was a lot of work. There is so much you need to look at and until you effectively do it yourself, you don't really know what to expect. In the next days I'll blog in more detail about the preparation, the content of our three day course and how I experienced our European Oracle Application Express Training Days (with pictures!) and the days after. I already want to thank everybody who attended our first open APEX training days... you all made it an unbelievable experience!